On December 15, Kiki was rushed to the AT rescue center by one of our volunteers, 范強森. 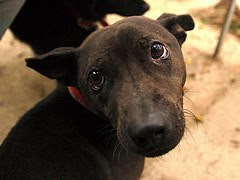 Kiki was found near Taiwan University. Her eyes were stuck together and very swollen. They were still closed. We suspect that she was born this way and had never opened his eyes. She was very quiet. We rushed Kiki to the vet, who removed the mucus covering her eyes, allowing her eyelids to finally separate. She could now open her eyes but they were still very swollen. She looked like an alien. The vet said that her eyes were beyond help. They would need to be removed when she was bigger and stronger. The vet prescribed some medicine to fight her constant eye infection and urged us to take good care of her. After visiting the vet, we kept cleaning Kiki’s eyes. We painstakingly used moistened tissues to gently soften up the mucus that continued to ooze out. We gave her medicine, kept her warm, and just like a mother cat, we rubbed her bottom to help her go to the bathroom. Kiki didn’t poop for two days. We were really worried, so we took her back to the vet. This time, we took Kiki to the 士東 animal clinic, to a vet who specializes in kitten care. The vet advised us to give Kiki a cone collar and prescribed some eye drops. The vet urged us to administer the drops as often as possible. The drops would soften the mucus and remove debris from Kiki’s eyes. As far as Kiki not pooping, we needed to spend more time massaging her. 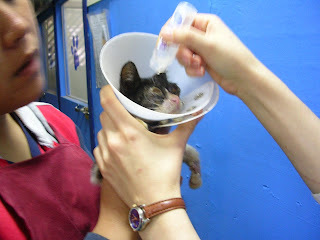 Kiki was so tiny, we had a problem finding a cone collar small enough for she. So, we made one ourselves out of paper. Yeah! Kiki finally pooped! And it was a good one. Unfortunately, Kiki was able to wriggle out of her homemade headgear. We had to find something small enough for her to wear that would substitute for a cone collar, such as a swim ring. Besides giving her medicine and constantly administering eye drops, we prayed for a miracle to save Kiki’s eyes. After every meal, we massaged her tummy. Even though Kiki was very sick, she still had a good appetite. During those first three days, Kiki was a good girl and ate all her food. She was showing us that she wanted to live. Kiki was pooping normally, but her eyes had not improved. We were going to Xizhi, so we took her with us. In Xizhi, Dr. Lin informed us that Kiki had a highly contagious herpes virus. Her eyes were seriously affecting her health. The most humane treatment was to end Kiki’s suffering, as this disease is highly contagious and could infect other cats at Animals Taiwan. The Vet recommended that we put Kiki to sleep. This brought tears to our eyes. We contacted other vets about Kiki’s illness. Once more we asked for more details about Kiki’s condition from Dr. Lin and explained about her living situation at Animals Taiwan. Afterwards, Dr. Lin recommended that we have Kiki’s eyes removed because she was extremely contagious. On Friday, Lusan took Kiki to the 全國 Veterinary Hospital (Yuanshan Branch) to see Dr. Wang. If Kiki’s eye infection couldn’t be treated, Dr. Wang said it would spread to other parts of the body, such as the brain. Kiki would be in even worse shape than she was now. One of her eyes was in better shape than the other. Even if the infection were treated, the eye would atrophy on its own and would still need to be operated on. Dr. Wang said that although Kiki would have no eyes, she still could rely on her other senses, such as her ability to hear or smell. As long as care was taken to keep her living environment stable and not move things around, she could manage OK! Kiki has a good appetite. We hope that she will be able to pull through. The vet warned that even if the operation is a success, it will be important that Kiki be well cared for and that she have a strong will to live. Otherwise, Kiki’s chances are not good. I have great news! I got a foster home! 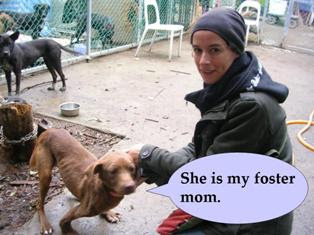 My foster Mom is Andrea and she lives in Taipei, but quite far down South. She has many other dogs at home so I will not feel lonely. Remember the last time Bandit had to wear a cone on his head? As soon as it was put on him, Bandit was so afraid he'd “scream.” This time Joey used food to distract Bandit. Once the cone was on, he gave him some food. Bandit was so focused on the food, he forgot to be frightened of wearing the cone. Joey has a way with animals!